Fair warning: I am highly prejudiced in favor of this book! Why? 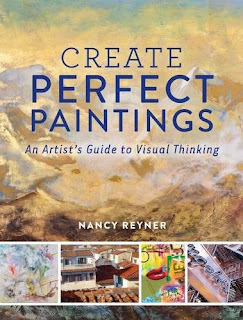 Because not only does it contain the very best explanation and practical plan for critiquing your own work that I've ever found, but also because I am absolutely in awe of Nancy Reyner's personal painting work. Fear not, though. 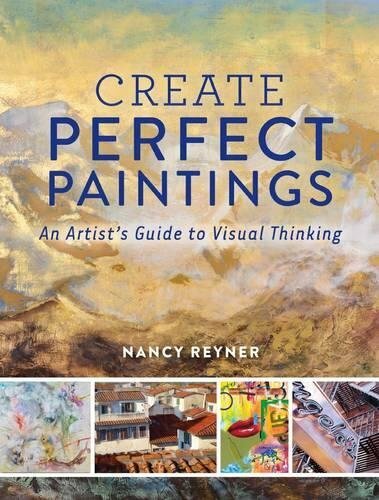 You can paint (or color, or collage) in a totally different style from Nancy and still learn everything you need from Create Perfect Paintings, because the subtext is to create perfect paintings for YOU. This is not a painting techniques book. Instead, it focuses on teaching you how to look deeply into an image (yours or someone else's) and to analyze the effects that it has on you as a viewer. Technique is important, but being able to manipulate your viewer's eye movements and perception is what Nancy says separates an amateur from an experienced artist. The book starts with a short but necessary section on "Essentials," that is, the definition of artistic terms and concepts. 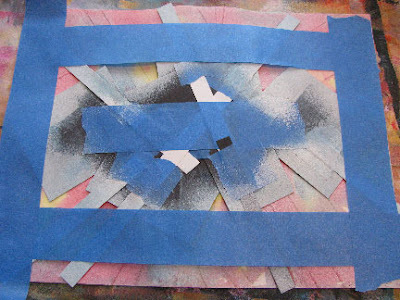 Section two discusses the "Play Phase" of painting, in which you work from your right brain, shut off the inner critic for a spell, and avoid falling into the same old-same old trap. Section three is my favorite. I have never been exactly sure what I should be looking for when I critique my own work. Yeah, I know that I need to look at the composition, the lines, the color, etc, etc...but so what? 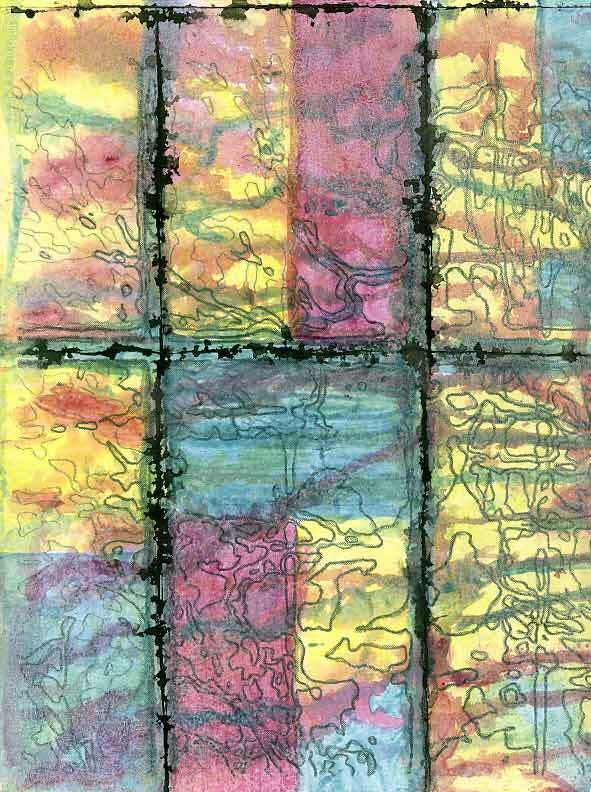 Nancy teaches you how exactly to look for opposites and contrast, entrances and pathways, dead zones, hot spots, spatial depth, and how to know when it's finished. She calls this The Viewing Game...which I find much less scary than the word critique! This queen of all sections is followed by two more, which focus on check lists, color information, framing, freeing creative blocks, discovering new ideas, and forming a critique group. You just won't believe how much Nancy has managed to pack into this book! 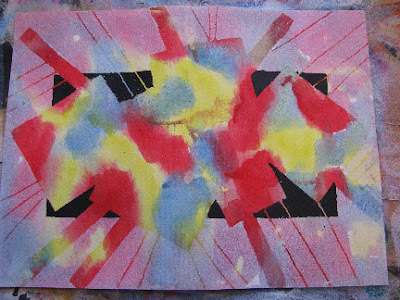 This piece started with a piece of watercolor paper that was wet. 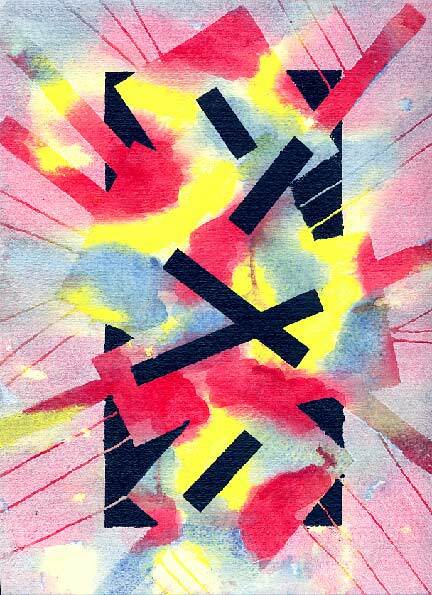 I used dilute acrylics to paint a watercolor-type of background: Hansa yellow light, Cerulean blue, Pyrrole red. When dry, I figured out where the central shape was going to be and I added some lines with Fineline resist fluid. 1. 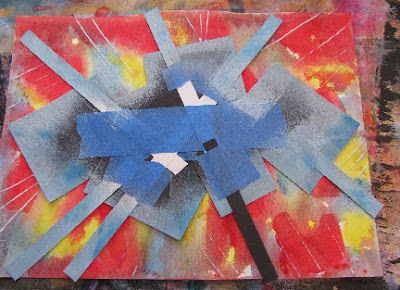 Create a mask from card stock and painter's tape. Roll over the exposed painting with a light coat of white gesso on a small foam roller. 2. 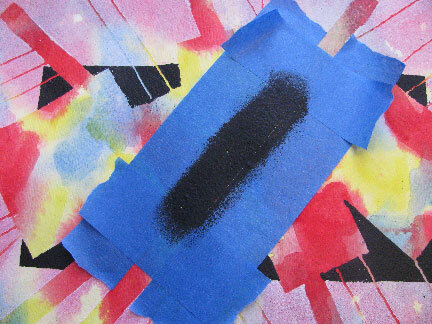 Use painter's tape to create an outer frame which will be rolled with black gesso. 3. Remove the masks and tape, and remove the resist from the lines. 4. Use painter's tape to position black bars across the central shape. Use black gesso. 5. I liked it on end the best of all the orientations. 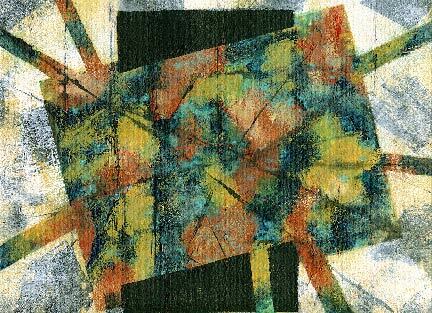 Here is another example of a piece that almost got abandoned, ripped in two, or just plain thrown out. I started with colors and techniques that had served me well in the past, but just didn't seem to work this time. 1. 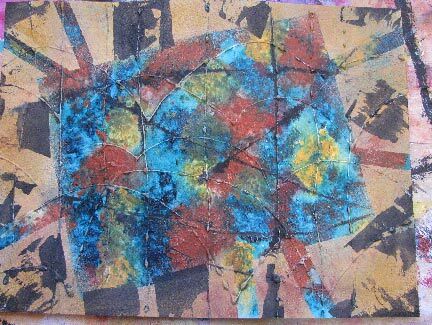 I failed to write down the colors that I used for the background, but I think they were probably Cobalt teal, Ochre and Hansa yellow medium, and Red oxide. I used black India ink to create some directional lines, and then rolled a mixture of White gesso and Titan buff over a paper mask. I was a bit underwhelmed. 3. 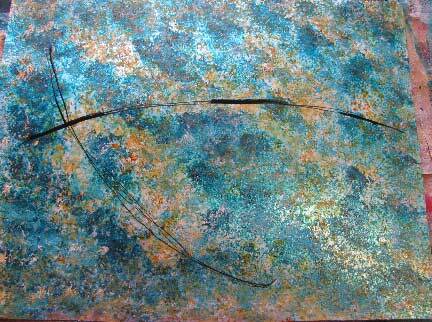 I used Ochre mixed with glazing medium to unify the colors a bit. Now we're getting somewhere. Over that, I added more black ink lines. There's a certain freedom you feel when you believe that a piece is ruined anyway! I neglected to take a whole lot of step-out photos for this piece, mostly because at one point it went terribly wrong and I almost abandoned it. Instead, since I had nothing to lose, I gambled on a new direction, and it is now easily one of my favorite pieces from the past few months! It was honestly not until I got to step 7 that I realized what it was, because I had it turned on it's side the whole time I was working on it. 1. The substrate is wide vinyl tape in a brushed steel finish, over stiff paper. I sandpapered it lightly. 2. 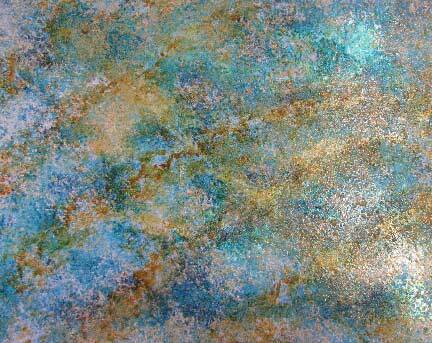 Acrylics used: Turquoise phthalo, Cobalt teal, Titan buff, and Quinacridone gold. 3. 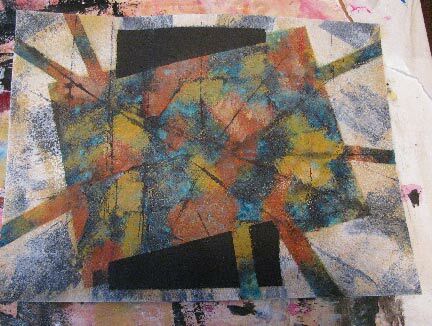 Mark out where the shape will go, and use black ink and tar gel to outline some random shapes. 4. 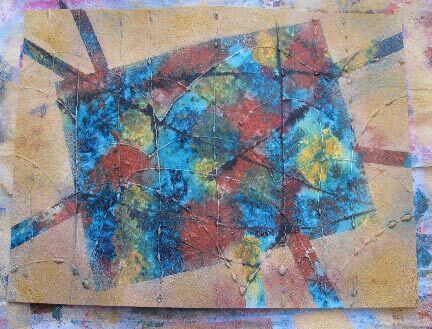 Cover the entire piece with dilute white gesso, and scrape it off with a plastic card. 5. Flood the line area with dilute colors, letting them mingle. 6. 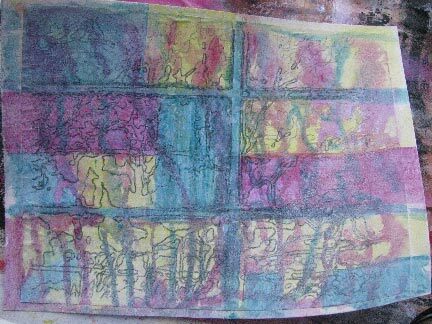 Cover the background areas with polymer medium, and embed kosher salt in it. Add a wash of dilute blue interference and allow to dry. Brush away the salt. 7. Add black ink lines with a razor blade. 8. Strengthen and adjust colors in the line area. Books: fabulous color for Spring! I am tired of the browns and grays and blacks and whites in my New England landscape. I want COLOR!! These two new books from C&T Publishing are just what the doctor ordered! 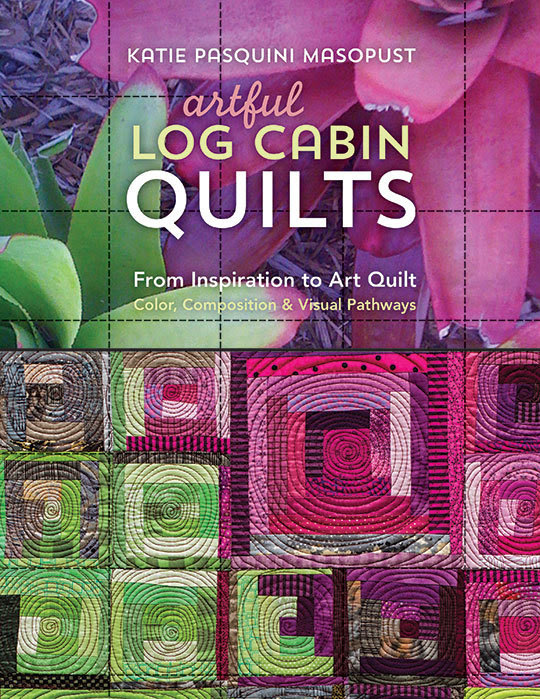 Take the first steps to becoming an art quilter with popular teacher and best-selling author Katie Pasquini Masopust in her new book, Artful Log Cabin Quilts. 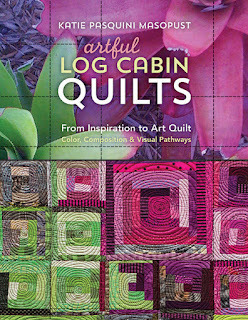 Starting with an inspiration photo or painting, choose fabrics to create your own artistic log cabin quilts. Learn to navigate visual pathways and composition, applying easy techniques and experimenting with color. Student work is presented, showing that anyone can create an art quilt! Design and make your masterpiece with freeform log cabin blocks using this versatile method. 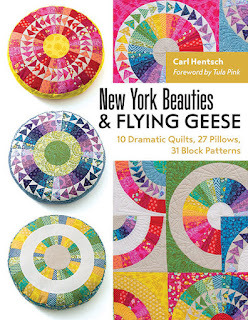 Become a skilled foundation piecer with New York Beauties and Flying Geese blocks that amaze! 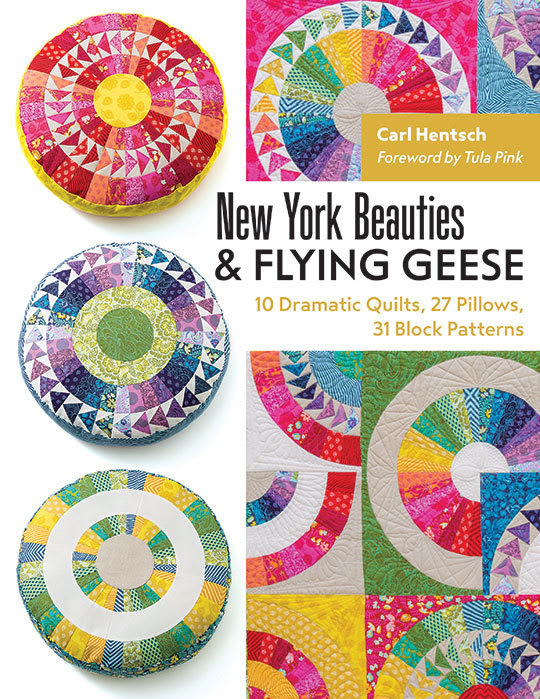 Carl Hentsch simplifies a technique loved by many with his straightforward approach to curved piecing, foundation piecing, and simple machine appliqué. Stitch your way through 31 architectural block patterns, ideal for advanced beginners and intermediate quilters. Then it's time to practice on 10 full-size quilts and 27 bonus pillow projects with lively color combinations to provide movement and drama. Late last fall, I visited the Boston Museum of Science with some friends. It shouldn't come as much of a surprise that my two favorite things were the Leonardo da Vinci exhibit (the intersection of art and science) and the large glass wall looking out over Boston Harbor. Especially the view from the second floor. I probably took more pictures of that view than of anything else. This piece is pretty obviously not an exact representation of what I saw out the window, even though most of my pictures were enlarged past the point of blurriness (deliberately). I did a black marker "sketch" of the major shapes and textures to start off with. 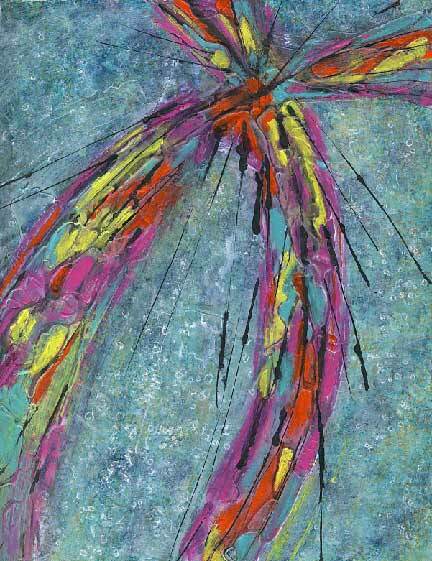 Then, I did some acrylic pours with Hansa yellow light, Turquoise phthalo, and Quinacridone violet. Less than satisfied with the look of the pours, I tried making glazes of some of the colors and painting them in window pane sized blocks. Still not thrilled, although I did like it better when I tipped it vertically. What finally brought it together was deciding that since it was ruined anyway, why not...?? I strengthened the color blocks, and then mixed a glazing medium with white gesso and a touch of Quinacridone violet. This mixture was applied all over the piece with a foam roller. 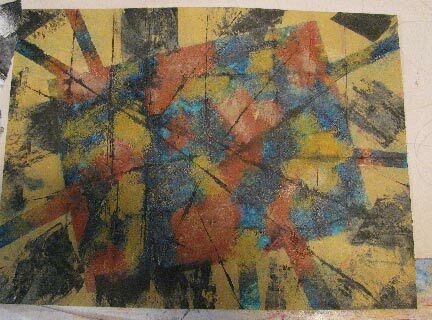 I spritzed it lightly with rubbing alcohol to texture it and blotted gently. As a final touch, I added a few India ink lines, using a tiny pipette.